The ViaSat 2 and Eutelsat 172B satellites, manufactured by aerospace rivals Boeing and Airbus, respectively, were deployed from the Ariane 5’s upper stage less than an hour after lifting off at 2345 GMT (7:45 p.m. EDT; 8:45 p.m. French Guiana time) from a European-run spaceport on the northern coast of South America. ViaSat says its newest satellite, which weighed 14,149 pounds (6,418 kilograms) at launch, can process and relay more bandwidth than any commercial communications spacecraft in history. ViaSat 2 is built to beam high-speed Internet into homes and businesses across the Americas, and link air travelers high above the North Atlantic Ocean. The Carlsbad, California-based broadband provider said ViaSat 2’s Ka-band communications instruments can handle 300 gigabits per second of total network capacity, offering customers more bandwidth and lower cost. An upgraded ground network will work with ViaSat 2 to beam broadband into more homes, and ViaSat’s strategic partnership with Eutelsat will allow airline passengers flying from North America through Europe to stay connected. ViaSat 2’s Internet signals will mix with Eutelsat’s KA-SAT broadband satellite, which is positioned over Europe, North Africa and the Middle East. The Eutelsat 172B communications satellite rode into the lower position inside the Ariane 5’s dual-payload stack, debuting a new satellite design built by Airbus Defense and Space that relies on a plasma thruster deck deployed on maneuverable robotic arms for pointing. The xenon-ion propulsion system, which is more efficient but generates less thrust than conventional liquid-fueled engines, will take around four months to guide Eutelsat 172B from the orbit reached by Thursday’s Ariane 5 launch into its final circular geostationary orbit over the Asia-Pacific region. Eutelsat 172B is the first commercial European-built satellite to rely entirely on electric propulsion, but Airbus satellites have employed similar thrusters for fine-tuning their orbits on past missions. Airbus’s all-electric satellite design, called the Eurostar E3000e, is the second such spacecraft platform to use xenon-ion thrusters for all orbit-raising maneuvers. Boeing pioneered the technique in the commercial satellite market, and has built five all-electric communications satellites that have launched since 2015 for Eutelsat, Asia Broadcast Satellite and SES. The European Space Agency and CNES, the French space agency, also contributed to the all-electric satellite development. The benefits of all-electric propulsion include smaller-sized, lighter satellites, allowing spacecraft to launch on less expensive rockets, or in the lower-cost lower position on the Ariane 5. But satellite owners must trade that benefit with the longer journey between launch and a geostationary satellite’s entry into service, several months in which the spacecraft is not generating revenue. The nearly 180-foot-tall (55-meter) Ariane 5 took off on 2.9 million pounds of thrust, lighting up a mostly cloudy evening at the Guiana Space Center as it arced to the east over the Atlantic Ocean. The rocket jettisoned two solid rocket boosters just after the flight’s two-minute point, and released its Swiss-made nose fairing after climbing through the rarefied layers of the upper atmosphere into space. The Ariane 5’s Vulcain 2 main engine, burning a mix of cryogenic liquid hydrogen and liquid oxygen, shut down around nine minutes after liftoff, and an upper stage HM7B engine, also consuming hydrogen fuel, fired more than 16 minutes to attain the speed required to enter orbit. The Ariane 5 aimed for an orbit with a low point of 155 miles (250 kilometers), a high point of 22,186 miles (35,706 kilometers), and an inclination of 6 degrees. The satellites’ combined weight — 21,977 pounds (9,969 kilograms) — set a record for the heaviest spacecraft stack ever launched into geostationary transfer orbit, the drop-off point for most large communications satellites heading for perches high over the equator, according to Arianespace, the Ariane 5’s launch operator. The Ariane 5’s Sylda structure built to accommodate two large satellites on the same rocket is also technically part of the payload. 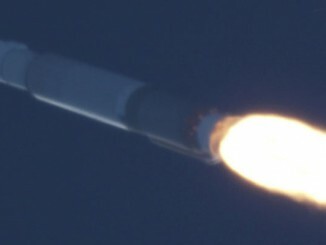 Including that piece, the performance required on Thursday’s launch totaled 23,953 pounds (10,865 kilograms). Telemetry radioed through ground stations in Africa confirmed the Ariane 5 deployed ViaSat 2, released the Sylda dual-payload adapter, then separated Eutelsat 172B after reaching the planned orbit. Officials said ground controllers made contact with both satellites soon after deployment, verifying their health after the launch. Stephane Israel, Arianespace’s chairman and chief executive, declared the mission a success, extending the Ariane 5’s streak to 79 straight successful launches dating back to 2003. 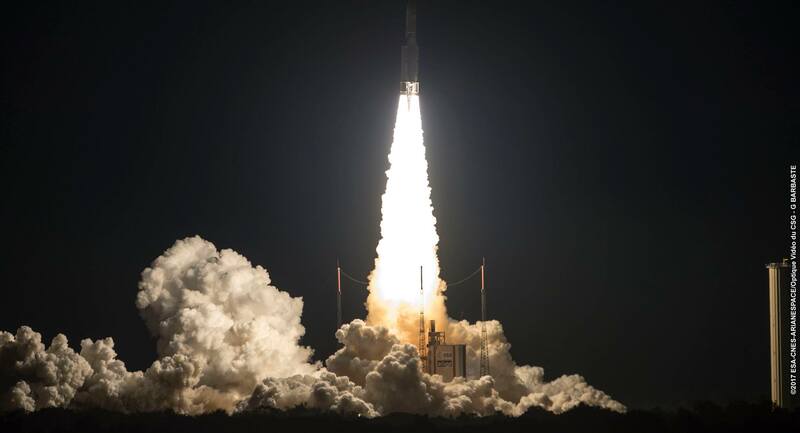 “Tonight, Ariane 5 delivered for two major customers at the service of global connectivity,” Israel said. The two telecom satellites launched Thursday were insured for nearly $800 million, the highest-ever insured value for a single launch. Engineers have squeezed more capability out of the Ariane 5’s commercial configuration, dubbed the Ariane 5 ECA, since the version made its first successful flight in 2005, adding more than 3,300 pounds (1,500 kilograms) to the rocket’s capacity by scrubbing unnecessary weight and margins from the vehicle, according to Israel. “With the support of ESA and CNES, and in partnership with our prime (contractor), Airbus Safran Launchers, activities are underway to further increase this performance, step-by-step, by about 250 kilos (551 pounds) until the end of 2019 to always exceed the expectations of our customers,” Israel said. The ViaSat 2 and Eutelsat 172B satellites should be operational before the end of this year once reaching their final perches in geostationary orbit nearly 22,300 miles (35,800 kilometers) over the equator. ViaSat 2 is heading for a position at 69.9 degrees west longitude, offering line-of-sight coverage of the Americas and the Atlantic Ocean. 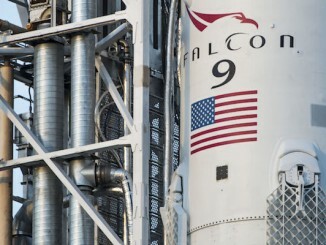 “We at ViaSat feel we’re on a mission,” Dankberg said. 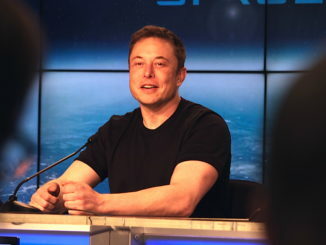 “We see this as a very big step forward in that mission, (and) we think we can make satellite as competitive for broadband services at home as any other terrestrial technology. We know that’s an audacious goal. Dankberg said ViaSat 2 is the next step in transitioning the company from a domestic player in the U.S. market, to a regional operator, and eventually into a global competitor with the ViaSat 3 program, which features at least three satellites that will begin launching in 2019. The 7,828-pound (3,551-kilogram) Eutelsat 172B satellite is heading for an operating position at 172 degrees east longitude in geostationary orbit. Eutelsat’s newest satellite will replace the 10-year-old Eutelsat 172A spacecraft, which will be relocated to another position in geostationary orbit. 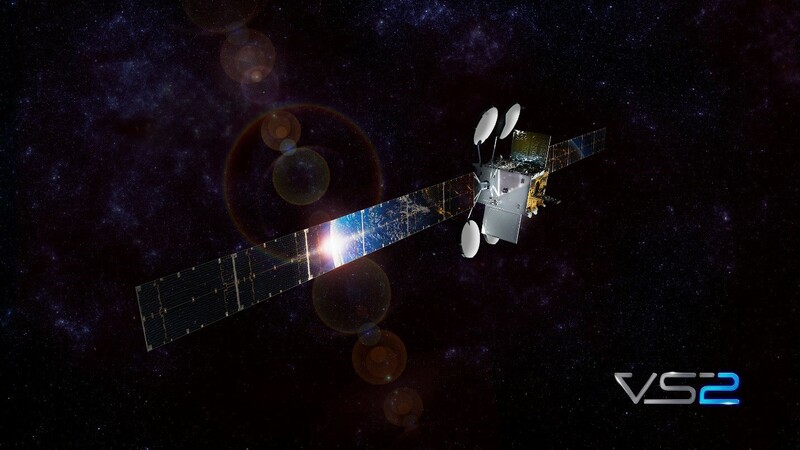 Eutelsat 172B is a “triple-mission” satellite, offering high-throughout Ku-band services for in-flight wifi and connectivity for airline passengers in the Asia-Pacific, along with regular Ku-band and C-band transponders for video broadcasting, corporate networks and cellular backhaul. Panasonic Avionics Corp. will use Eutelsat 172B’s in-flight connectivity capacity on commercial airline flights. “Eleven elliptical spot beams will enable Panasonic to bridge the West coast of North America to Asia, and down to Australia, supporting rapid air traffic growth in the region and surges in bandwidth use across densely-used flight paths,” Eutelsat said in a press release. 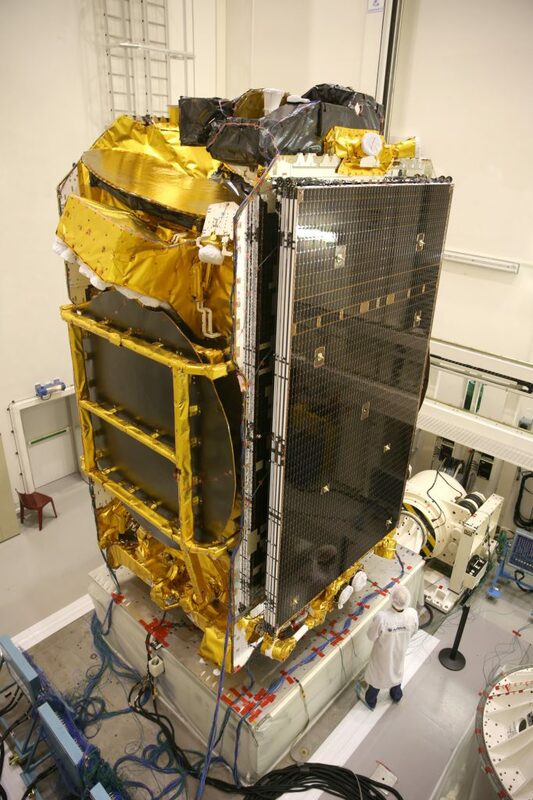 The next Ariane 5 launch from French Guiana is scheduled for June 28 with two communications satellites for Inmarsat and the Indian Space Research Organization. That will be followed by a mission by Arianespace’s lightweight, solid-fueled Vega booster in late July with several Israeli satellites on-board.